I was first introduced to John from Twiss Pens via a tweet by Fountain Pens Geek. This is the second fountain pen I have purchased from him. 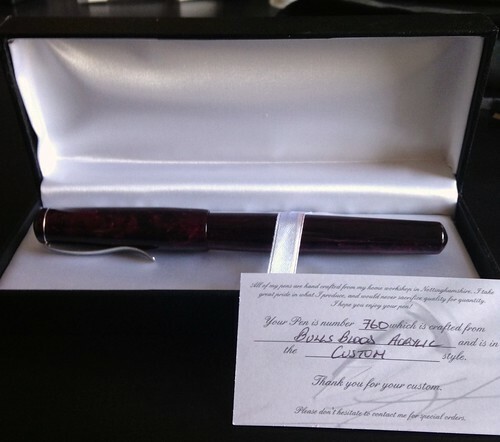 The first was a custom handmade fountain pen that I plan to review soon. The second, was a limited edition direct from his website. 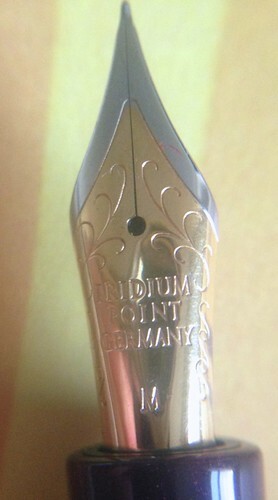 Where do I begin with what simply put is the most stunning pen I have ever bought? 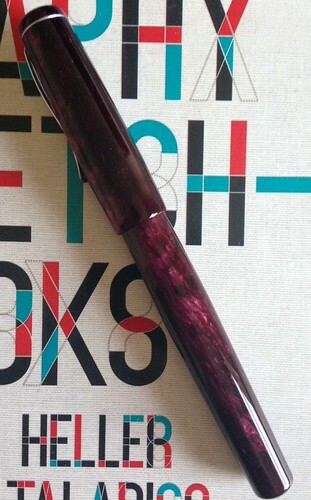 The main material used for this fountain pen is called ‘Bulls Blood Acrylic’. I have been struggling how best to describe the look of this material. Depending on what way the light hits this pen, you get a different shade/tone of colour. It is a mixture of different shades of purple. The top and base are finished with really nice curves. They just aren’t flat finishes. The grip area curves inwards towards the middle which makes this fountain pen very comfortable to hold and also very natural in the hand. There is stainless steel pen clip that fits the design really well. You can see the the ban that joins the clip to the cap. This is a small detail that for me sums of this pen. Everything is about the attention to the small details. Another interesting feature of this pen is that it very easy to take apart. This makes it brilliant to clean when changing inks. As the main material used for this fountain pen is acrylic, it makes this a lightweight pen. This makes it a very comfortable pen to use for long periods of writing. The weight is very balanced. The cap does feel a tad bit top heavy but this weight difference is so small. To remove the cap you just simply unscrew it. The cap doesn't screw into place when posted and I have found it doesn't really post that deeply. When posted this becomes a very long fountain pen to hold. I have found that for the most comfortable writing experience, don't post the cap. With the cap it comes in at 14.9cm in length. Without the cap it is 13.6cm in length. With the cap posted it is 18.8cm in length. Comes supplied with a converter which means you can use bottled ink. The Nib has a ‘M’ printed on it but John grinds his own nibs so I have mine ground down to a Extra-Fine which produces a great line and writes very smoothly. The nib unit is very easy to remove which makes me think that if you were to ask John, you could but different nib sizes from him. From what I remember it costed me roughly £120. It is one of my favourite pens and I really do recommend that when you come to buying you next fountain pen you consider John over at Twiss Pens. When I have e-mailed him with requests or questions he has been nothing but a joy to deal with. A lot of the bigger pen stores/sites should take note of his customer services. I have already had some exchanges with him a round what my next pen purchase should be from him. The photos simply don’t do this pen justice.